The dynamic dancing duo of Bristol Palin and Mark Ballas are well-positioned to move into Week Four following their beautiful performance of the Foxtrot tonight. As of this writing, Bristol has 6,457 Facebook friends. Bristol had achieved her 6,000th friend on the social network a little more than 14 hours ago. Last week, Todd flew to Pierre, SD, as a guest at the Joe Foss Institute and attended their annual pheasant hunt fundraiser. While meeting some great patriots from all across the country, Todd received a quick shooting pointer from Didi Foss, the wife of World War II fighter pilot, Medal of Honor recipient, and South Dakota hero, Joe Foss. Then he picked up critical “tactical field instruction” from General Walter Boomer, USMC (ret) and LTG Jerry Boykin, USA (ret), which I’m told dramatically improved his ability to stalk the feathered beasts. The Joe Foss Institute’s mission is “to teach youth patriotism, integrity, public service and the significance of America’s freedoms.” The Institute makes an impact by using veterans to take its message into classrooms, assemblies, and now into year-round camps through its new partnerships with the Boy Scouts of America and the Salvation Army. You can learn more about this great organization by visiting their website at http://www.joefoss.com or following them on Facebook at http://www.facebook.com/joe.foss.institute. And in other family news, Bristol continues to have a ball while stepping up and stepping out of her comfort zone on DWTS! She’s dancing again tonight, and you can keep track of her (and vote for her too!) and all the brave souls in this competition by visiting her Facebook page here. Last night, after Jennifer and Derek’s fantastic Jive, the judges gave gushing critiques. But then they gave them three 8’s. While Brooke was interviewing the team in the skybox, boos started in the audience, and Brooke and team Baby Derek, busy on air with their backs to the audience, didn’t know what the boos were about. When Brooke’s interview was done, the camera cut to Tom in the audience sitting next to Sarah Palin, introducing her. And the audience applauded for her. Rumor spread that the boos were for Sarah. But, in fact, the boos were the crowd reacting to the judges’ score, thinking that Jennifer and Derek deserved higher for what was, admittedly, an amazing performance. Tom tweeted about it and others spoke up, but many people didn’t believe the story. Then Tom starts talking, the audience immediately quiets down, and as soon as he introduces Sarah Palin the audience applauds. Which shows that the Dancing with the Stars audience is always polite and appreciative of guests, but they’re quite opinionated about their dancing! Bristol and Mark will dance the Foxtrot tonight. Endorsements continue to roll in for Michael Grimm, who opened a second campaign headquarters location at 7317 13th Avenue, Brooklyn, New York last Saturday. Among the new endorsements: National Republican Congressional Committee’s top tier in its “Young Guns” program, the Brooklyn GOP, New York State Senator Marty Golden, and the National Vietnam and Gulf War Veterans Coalition. A prior mailing reported on his New York Post endorsement and fund-raising goal. Grimm is running for New York’s 13th Congressional District, which covers Staten Island and part of Brooklyn. 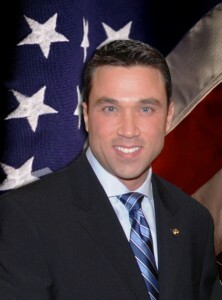 Governor Palin endorsed Grimm on July 28, 2010, along with John Gomez for NY-2 who ran unopposed and won. She was the first to be acknowledged and recognized during his victory speech. US for Palin Publisher, Ron Devito is campaigning for Grimm. For the primary, Devito walked door-to-door in the 60th and 79th Election Districts, installed lawn signs in the 10314 zip code, called voters on primary day and closed the PS 36 poll. When Devito arrived to the victory celebration, Allegretti had already called Grimm to concede. Watch Grimm’s victory speech here. Devito is continuing his work for Grimm, in the midst of another door-to-door walking blitz in his own neighborhood and one to the west of his targeting voters in all parties. In this video, Bristol and Mark talk with a reporter after the DWTS Week 2 elimination (h/tp Dance Bristol Dance). Both are coy about what to expect during their Story Week performance tonight. Mark did disclose that they will be doing the Fox Trot. Be sure to tune in tonight at the Dancing With the Starts Voting Page. You can also vote by phone by calling 1-800-868-3407 or by texting 3407. Bristol has made amazing progress each week on DWTS, and tonight should be no exception. Let’s support Bristol and Mark with our votes and help them go on to Round 4 of DWTS! TAPPER: OK. And Governor Palin, former Governor Palin has insinuated that Rouse — she suspected Rouse was part of a plot against her. She wrote about this in her book. She’s tweeted about it — tweeted suggestions about this recently. I was just wondering if you guys have any comment on that. GIBBS: No. I mean, you know, it — it’s a fairly silly accusation that is baseless. Gibbs’ quick dismissal of this as well as the question of state citizenship is a deflection of a question that deserves an answer, not a childish response. Since the press secretary is unwilling to answer it, allow me. Elton: So this has been a fascinating year watching what’s been happening back East. Reporter: So you’re an Obama man, Senator Elton? Elton: I’m a big fan. Reporter: Are you? Really? Is that an official endorsement? Elton: I guess we can call it that. I’ve not done it any place else, but I kind of weighed in with a contribution, a couple of contributions this last year, but yeah you can make it official now. So, the same individual who started Troopergate, was a “fan” and ardent supporter of then-candidate Obama? Elton is the kind of guy who doesn’t seem to be able to keep his mouth shut. NEN uncovered another audio tape in which Elton admitted to talking to Rouse a couple times a month about the election: “One of my great friends, somebody I talk to a couple times a month is Pete Rouse who is chief of staff to Barack Obama.” How ironic that an advisor to Obama be in such close communication with the individual, a democrat, who started the first ethics investigation against Sarah? But for the Obama campaign, one investigation was not enough. In typical Chicago-style politics, Sarah was a threat, so the Obama campaign continued on its mission to destroy her. NEN reported that the Obama campaign contacted the union for Alaska State Troopers, which is the union Mike Wooten (Sarah’s ex-brother-in-law and trooper identified in the investigation) belonged to. This communication resulted in another ethics complaint- this time by the union for Alaska State Troopers. When Sarah Palin gave her rollout speech followed by the RNC speech on September 4, 2008, she became an instant threat to the Obama candidacy. On September 9, 2008, according to The Next Right, “an Alaskan process server called [Bill Bennett’s radio show] to talk about how many calls she’s getting from media organizations trying to get court records on Sarah Palin, her son Trak, and their friends.” Palin had helped McCain come within a statistical dead heat with Obama in the polls and the Democrats were getting nervous. Commenters at Free Republic speculated that presidential candidate Barack Obama’s campaign operative David Axelrod was involved with getting Troopergate to conveniently hit the newsstands during the height of Palinmania on August 30, 2008. Axelrod’s fingerprints appear in Alaska immediately after Palin is announced as the Republican vice presidential candidate. From there they drove huge blog bursts on the Liberal side of the web and were picked up by the media for that reason. This process placed a series of lies, distortions and false allegations targeted at Palin in the mainstream news cycle – again, at the very same time Obama was attacking her daily on the stump. David Axelrod began working very closely with Anita Dunn, who along with Rouse “advised Tony Knowles in the 2006 Alaska Gubernatorial campaign” according to Conservatives4Palin.com. Almost all of the misinformation about Governor Palin came from Alaska, partly from local Democrats like Kim Elton (of Troopergate fame) and from “progressive” bloggers. Publicly, of course, there were no Team Obama fingerprints to be found on these slanders but it beggars belief to assume that these were all spontaneous outpourings from concerned citizens. Some might suggest a whiff of orchestration and who else better to help connect the dots than someone closely involved with Alaskan Democrats since at least 2004 – someone like Anita Dunn. 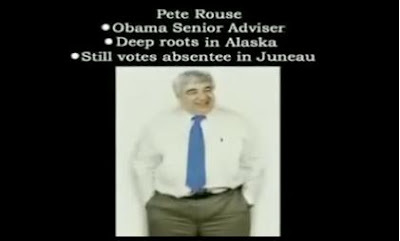 Pete Rouse “was the one who recruited Elton, a former journalist, into politics” according to the Anchorage Daily News. Rouse also worked with Anita Dunn for Tom Daschle. In 2008, after John McCain selected Governor Palin to be his running mate, the Obama campaign set up a political hit-team called “Alaskan Mythbusters.” The group was headed up by Rouse associate, Tony Knowles. The “Mythbusters” had the ironic task of creating misleading political attacks, specifically on Governor Palin. They also spent a lot of time talking about Kim Elton’s “ethics” investigation. With all the speculation about Rouse, we can’t overlook the role that the guy who ended up in the office next to him played. Axelrod the AstroTurfer most likely carried out the details of the operation during the presidential campaign. Michelle Malkin wrote “Rusty Shackleford — with help from Jane of Armies of Liberation, Stable Hand, the Jawa team, Dan Riehl, Ace of Spades, and Patterico – traced a Palin-bashing YouTube video to a Democrat public relations firm, Winner and Associates, and one of its employees, Ethan S. Winner.” Axelrod is known for his Astroturfing companies. But instead of doing the video in house, he farmed it out. Malkin explained it on Fox News. The suit, filed in Alaska Superior Court, takes aim at Stephen Branchflower, the former prosecutor leading the probe; Sen. Hollis French, the Democratic state lawmaker chosen to manage the investigation; and Sen. Kim Elston [sic], the Democratic chair of the Republican-dominated Legislative Council, which voted unanimously to conduct the probe. All three men, the suit alleges, have conflicts which prohibit their involvement in the investigation. French and Elston have publicly supported Obama, the suit notes. The suit claims Branchflower “developed a friendship” with the fired official at the center of the probe, Walt Monegan, when Branchflower was a prosecutor and Monegan was in law enforcement. It asks that if the probe continues, all three men be removed. The suit was dismissed by Superior Court Judge Peter Michalski, who was appointed by Governor William Sheffield (D-AK) in 1985. Also, the mainstream media never did any investigation into the allegations put forth in the complaint. In other words, they ran with stories based on reports from Democrat insiders without balancing them againsts statements from McCain campaign officials or researching the partisan nature of the probe. Branchflower’s report came out Oct. 10, 2008, in the heat of a bitter presidential campaign. Then, Palin filed her complaint against herself on Troopergate with the Personnel Board. Its report, done by the Personnel Board-hired counsel Tim Petumenos, cleared Palin and came out the evening before the election. Van Flein says Branchflower’s finding that Palin violated the ethics act is flawed because she received no monetary benefit from whatever actions she and her husband are accused of. He cited several prior ethics investigations. “The common thread of all of these Ethics Act cases is money and the use of a government position to personally gain,” Van Flein’s statement says. The McCain-Palin campaign also responded. Because Branchflower’s report does not recommend any particular penalty for Palin, it shows the investigation was outside the Legislature’s authority, campaign Meghan Stapleton said. “The Palins make no apologies for wanting to protect their family and the public interest by reporting to appropriate authorities the conduct of a threatening and abusive trooper,” Stapleton said. Sarah was cleared, and democrats Kim Elton, Hollis French, Beth Kerttula, Stephen Branchflower, and others were taken to the wood shed for hiding evidence that cleared Palin, and even used the wrong statute as the basis for their witch hunt, Barack Obama “rewarded” Kim Elton with a make work job at the Department of Interior. A little Chicago style pay-for-play. How’s that for a silly, baseless accusation, Mr. Gibbs? Do you care to be a little more substantive next time you answer a question like that? You can’t flick the whole nest off thinking it’s just one bee. The American people want an explanation from the White House press secretary, not just a silly song and a dance. At the FORUM you’ll have an opportunity to hear Governor Palin’s remarks discussing a variety of issues that are important to, and currently affecting, the people of the greater Bay Area. There will be a Q & A session posing questions from locals, as well as questions from school kids. We believe in our youth perspective and know you all will enjoy their insight into America. TONS of opportunities to receive AUTOGRAPHED copies of ‘Going Rogue’, Governor Palin’s book. Free T-shirt GIVEAWAYS! The event will be filled with fun, music and insight into what’s going on in America and how you as patriotic loyal Americans can make a difference! VIP RECEPTION offering a premier Photo Opportunity with Gov. Palin in the Marriott San Jose – enjoy mingling with the Bay Area’s finest in an intimate setting with Gov. Palin. Contact Elle.Morgan@liberty-freedom.org or call Elle Morgan at 415-994-3425 for more information and ticket opportunities for attending this VIP event. DINNER at the Marriott San Jose – you will enjoy a four star dinner and hear Governor Palin’s remarks on issues that affect the greater Bay Area. Contact Elle.Morgan@liberty-freedom.org or call Elle Morgan at 415-994-3425 for more information and ticket opportunities for attending this event. The Liberty & Freedom Foundation is dedicated to educating the public about conservative principles and promoting active participation in the political and public policy process. By investing in grass-roots activism and informing the American people about conservatism, the Foundation will help to ensure that our nation is led by conservative principles and ideals. Twelve days and 18 hours after launching her official Facebook Page, Bristol Palin already has 6,000 friends. The milestone was achieved October 4, 2010 0842 (8:42 AM) EDT. Bristol, who is Gov. Palin’s eldest daughter, launched her page on Tuesday, September 21 at 1442 (2:42 PM) EDT. She is a contestant on Dancing with the Stars, and an advocate against teen pregnancy for the Candies Foundation. Her performance of the Quickstep with Ballas propelled Bristol to the Week Three Round of Dancing with the Stars, which airs Monday, October 4, 2010. Though she is principally focused on preparing for Monday night’s performance, Bristol slipped off her dancing shoes, donning business wear to deliver her pro-life message in Visalia, CA. She was a guest on the Eddie Burke show Saturday night as well.